Lunar Yoga is a collective of Nya Patrinos' supportive practices for transformation, manifestation, healing and exploration of the sacred feminine, right brain, restoration, and rejuvenation. ​Have you ever wondered how to connect more to the moon? The Moon Phase Goddess Cards explore how to sync up with the energies of the new moon, full moon, 1/4 moons and all phases in between. 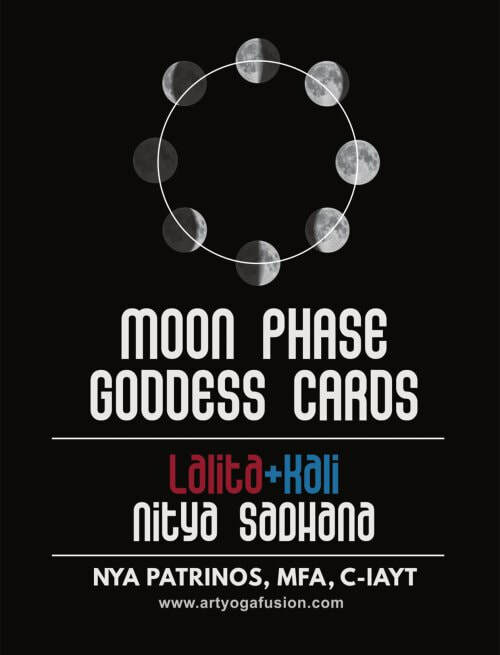 Learn about the Kali and Lalita Nityas the moon goddesses which correspond to each night of the lunar calendar. The time from the new moon to the full moon is one of manifestation and is ruled by Lalita, the red goddess, and all her forms and aspects. The time from the full moon to new moon is one of transformation and is ruled by Kali, the blue-black goddess, and all her forms and aspects. Use these double goddess cards cards to plan when are the best times to start new projects, meditate, socialize, manifest and rest.